April 20, 2008 by Alphageek in "bourbon wild turkey alphageek"
This is where I am going to write about random thoughts that I am interested in. Mrs. Alphageek said that she was tired of my random thoughts on very profound subjects. I replied that people would love to read what I have to say and she just laughed. She has to be nice to me, I think it is in the wedding vows. Because I was drinking one of my 10 or so bottles of bourbon, I decided to start with a discussion of my inventory of bourbon. A Hokie starts with Wild Turkey. 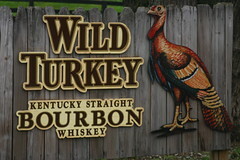 We stopped by the Wild Turkey distillery while driving to and touring various bourbon distilleries. Obviously, we were in Kentucky. That is where I took the picture. Mrs. Alphageek was with me. She decided that I could buy whatever I wanted at the outstanding Wild Turkey gift shop. I think she was trying to get me to buy furniture later in the week. For your information, there are many items at the gift store that are not available online. Many of those items are now in our house and (more importantly) our tailgating supplies. 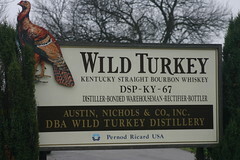 This is where I met Jimmy Russel who is the master distiller of Wild Turkey bourbon. I guess if you buy so many items in the gift store that the folks who work there giggle a little bit, you get to meet Jimmy Russell. I had my picture taken with him wearing my Virginia Tech sweatshirt, the week before we play uva. By the way, we won. At any rate, Wild Turkey rare breed is still my favorite bourbon. I recommend three ice cubes and two fingers worth in a rocks glass.